Global suppliers and exporters of Synchronous Motors, Stepper Motors, Reduction Gear Heads, DC Geared Motors and Linear Actuators, we ventured into the market in 1967. 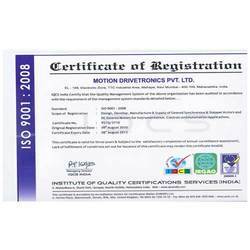 Since then Motion Drivetronics Private Limited (MECHTEX) has come a long way in positioning itself as a reputed brand. Our products consist of Synchronous Motors, Stepper Motors, Reduction Gear Heads, DC Geared Motors and Linear Actuators. These are further divided into sub-categories. The products are highly user friendly, economical, technically superior and of high quality. Our name is highly recognized for Superior Performance, Energy Efficient and High Quality Geared Motors since 1967. Continuous R&D is one of the main focuses of our company. Our design engineers model parts which are assembled in 3-D aided by CAD system. The Managing Director supervises the R&D process and is directly accountable for the same. Our competitive edge lies in Experienced R&D, Wide product range, OEM expertise, financial strength and TQM and customized solutions. MECHTEX's personnel, distributors and customers contribute by participating in activities towards creation of technically superior and value added products. The key industries that we focus on consists of Electrical & Electronics, Automation, Instrumentation, Robotics, Automobile, Textile, Medical, Food & Beverages, General Industry, etc. Manufacturing and Trading of Synchronous Motors, Stepper Motors, Reduction Gear Heads, DC Geared Motors and Linear Actuators. This is our commitment and ongoing mission at Mechtex. Using state-of-the-art computer aided design (CAD) system; our design engineers perform 3-D modeling of parts and assemblies using advanced Analyses & Design Software Tools under the direct supervision and responsibility of the Managing Directors who has valuable and extensive exposure in the industry. We do even participate our personnel from various departments, distributors and even customers in R&D activities to come out with a better, technically superior and value added product or activity. Every Geared Motor is put through the paces – a rigorous design validation process at our extensive facilities in-house. They are tested repeatedly – some till the Geared Motor actually gives way – in conditions which replicate actual service and even potential extreme and emergency service, in an accelerated process. We thus say with pride that the Geared Motor is made to work through the intended design life – and not just perform during factory tests. We also say that we know exactly how the Geared Motor will perform in service.